45-Was it not the fact that Wilson had actually retired from the stage? 47-"You will proclaim a republic a republic!" 55-The "Union for the Defence of the Rights of Anatolia and Rumelia"
89-I will tell you something about the "Green Army,"
117-Eventually I took recourse to forming a party myself under the name of the "Party for the Defence of the Rights of Anatolia and Rumelia." 163-The " public opinion of the Mohamedan world would be alarmed and perturbed." 165-As the first duty of the Assembly that "the prescriptions of the Sheri should be put into force." The Government of the Grand National Assembly of Turkey have repeatedly declared that they are earnestly and sincerely desirous of peace; they have formulated their conditions which consist in demand ing the recognition of their national rights and have declared them selves ready, if these rights are recognised, to enter into negotiations which would be proposed to them. If the Entente Powers have re solved to settle the Eastern question on principles of right and justice at the Conference which they are going to hold in London, they must address their invitation to it to the Government of the Grand National Assembly of Turkey. We declare once more that an invitation prof fered under the above-mentioned conditions will be favourably ac cepted by the Government of the Grand National Assembly of Turkey. Mustapha Kemal, President of the Grand National Assembly of Turkey. Angora, 28 th January, 1921. To His Highness Tewfik Pasha, Stambul. We are convinced that a special opportunity of historical import ance is offered as a prominent statesman to Your Highness, who throughout your life has always rendered invaluable services to this country and this nation, to complete and crown all the services you have hitherto rendered. For our part, we are desirous to proceed in perfect unity. We are convinced that you will have a proper judgment about the incon veniences which would arise if the country were to be represented by two delegations at the Conference, to which we have been indirectly invited. The efforts which the nation has made for the sole purpose of obtaining its sovereign rights, the blood that has been willingly shed, the resistance and firmness it has shown in all the difficulties of an internal and external description are responsible for the new situation which we have to face to-day. On the other hand, the events in the world are taking such a shape that our independence, which is the aim we have put before us in the steadfastness of our resistance, will be secured. While we are preparing ourselves to defend our national rights before the Governments who want to condemn us to slavery and annihilation, it is imperatively necessary that all the material and moral forces of the country should act in perfect concord. It is therefore necessary that His Majesty should officially declare that he recognises the Grand National Assembly of Turkey, which is the only body in this country able to express the national will. In this way the abnormal situation prevailing in Constantinople, the fatal experiences of which have proved that it has continually done harm to the country and has existed for such a long time to the great advantage of foreigners, would come to an end. It becomes evident from the communication from the represen tatives of the Entente Powers that the participation of delegates from Stambul is only possible if there are such among them who are appointed by the Government at Angora and who have been furnished by them with full powers. Thereby the Entente Powers have recognised in a sufficiently clear way that the delegates who will negotiate for Peace in the name of Turkey can be appointed solely by the Grand National Assembly of Turkey. In virtue of our full powers and in the name of the duty which we have undertaken before history and on behalf of the nation, we propose to you to alter and clear up the position by joining us and accepting the principles advanced by us and proclaimed by the Government of the Grand National Assembly of Turkey, which is the only actually and justly lawful government in the country. By doing this you will facilitate the recognition of these principles by our enemies and thus hasten the happy end of all our struggles. If the sincere proposals which we are making with the object of our working to gether and of defending our national aims with our united strength should not be accepted and adopted, fear must be felt that the po sition of His Majesty, the occupant of the Throne of the Sultans, and the dignity of the Caliphate may run the risk of being shaken, and we declare now in our capacity as the Government who have been endowed with all real and lawful power which the nation has con fided in them, that the responsibility for such a catastrophe with all its incalculable consequences will fall directly on His Majesty. Taking all this in consideration, we are firmly convinced that Your Highness will perform the duty of historical importance which your conscience imposes upon you and that you will definitely and clearly inform us of the result. 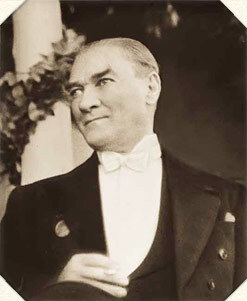 President of the Grand National Assembly of Turkey. 1. His Majesty will proclaim in a short Imperial decree that he recognises the Grand National Assembly. This decree will set forth that His Majesty has recognised the Grand National Assembly of Turkey, which has acknowledged the principle of the integrity of the Caliphate and the monarchy, in its present form and character and with its present rights. To add the details and the developments which the case would require might cause confusion at this juncture. 2. In case the conditions mentioned in paragraph i are fulfilled, the regulation of our internal situation a question, so to say, of an intimate character might be settled in this way :^ His Majesty will remain in Stambul, as heretofore. The Grand National Assembly of Turkey, possessing authority and responsibility, which is protected against any kind of attack and which combines all the qualifications necessary for their independence, will, together with the Government, remain at Angora. Naturally any body functioning under the title of Government in Stambul will cease to exist. Taking into consideration the peculiar position of Stambul, there will be a delegation of the Grand National Assembly with His Majesty which will be provided with full powers and entrusted with certain duties. 3. Later on care will be taken to provide means for the organisa tion of the administration of the town and district of Constantinople and to establish it. 4. As soon as the above conditions shall have been accepted and carried out, the Government will guarantee and arrange for the payments connected with the Civil list and the emoluments due to His Majesty, the Imperial dynasty and all the officials and other persons who have claims to pensions and salaries. The Budget passed by the Grand National Assembly already provides for this expenditure. Our exchequer enables us to cover these expenses. Telegram. 28 th January, 1921. Tewfik Pasha called the Council together, after which he sent me his reply. I am reading it to you verbatim. Stambul, 29 th January, 1921. To His Excellency Mustapha Kemal Pasha, Angora. Reply to your three telegrams of the 28 th January, 1921. The present Government who have for a long time recognised the necessity of a union between Stambul and Anatolia have assumed power with the view to secure, such unity and have hitherto made efforts to this effect. We are convinced that the endeavours which you have made in this direction, namely, to safeguard the sovereign rights of the nation, as well as the sacrifices you have made in human blood, have con tributed in a large measure to bring about the satisfactory state of affairs which now prevails. Consequently, we are prepared to accept proposals which are for the benefit of the nation. In respect to this, I inform you in what follows of our point of view concerning the matter you have brought to our knowledge. The fact that you have been indirectly invited to attend the Conference is evident, for the representatives of the Entente Powers are here. For this reason it appears to be quite natural that communica tion should be established with the Government which is in Stambul and which is endeavouring to work in harmony with you. The fact that the European Powers, who have hitherto not felt themselves called upon to recognise Anatolia, especially request the presence of delegates from Anatolia at the Conference, is a matter that can give you satisfaction. Consequently, it would not be necessary regarding the task which you have taken upon yourself on behalf of the nation to raise the question of form without taking advantage of this favourable change. On the other hand, our delegates will not constitute two delegations when we have shown that we are united, but only one. We need not fear any inconvenience about this, because the lan guage we shall use will be in conformity with the principles that have been adopted. Our duties towards the State and the nation, therefore, imperatively demand that we should derive the greatest advantage from the fact that a hand is held out to us at this historic moment. Will you be good enough to recognise that your absence would completely tie our hands with regard to the Greek claims and that our country would remain who can say for how long? a theatre of the horrors and sufferings of war ? The fact alone that we formulate our claims before the Conference, that we publish the name of our plenipotentiary throughout Europe, would not be injurious to us, even if the Conference should not lead to satisfactory results. The patriotism of Your Excellency and of your colleagues is a guarantee that this opportunity will not be missed. As it is natural that the resolutions adopted by former Cabinets will be annulled, resolutions which have had bad results for both parties, there is no longer any ground for dissension between us. If the executive power should be suppressed here, the fact that Con stantinople is dominated by the Occupation could result in the En tente Powers taking the administration of all governmental affairs entirely into their own hands and carrying out the stipulations of the Treaty concerning Constantinople. On the other hand, the fact that Greek troops are at the present moment in Constantinople and the surrounding territory makes these proposals impracticable. I do not even consider it necessary to confirm that the desire of maintain ing power is not important in these circumstances for our Council of Ministers. The question that must be settled as quickly as possible is the send ing of our delegates to the Conference, the date of which is approaching. Tewfik Pasha and his Government say that they have been working for unity between Stambul and Anatolia. That is perfectly true. We have also been working for this, but with the one difference that Tewfik Pasha and his colleagues as has been happening hitherto intended to annex Anatolia to Stambul and make it sub servient to Stambul which was occupied by the enemy s troops. Tewfik Pasha and his colleagues were endeavouring to unite Anatolia to the Stambul Government a government that had the peculiar characteristic that if no objection to its existence was raised by the world it owed this fact to its capability of facilitating the realisation of the enemy s designs. According to Tewfik Pasha and his colleagues, Anatolia s struggle had had a great share in creating the present favourable state of af fairs; but it is by no means due to this struggle alone on the part of Anatolia that the present situation has been created. Perhaps this old diplomatist attributed the whole merit in this affair to the fact that he had come into power. Angora, 31 st January, 1921. To His Highness Tewfik Pasha, Stambul. I. I am certain that in the three telegrams which I sent on the 27 tJl and 28 t31 January, 1921, 1 had explained to Your Highness clearly and explicitly all the conditions the carrying out of which was abso lutely indispensable. From your telegram of the29 tb January, 1921, however, I observe that you have not yet arrived at the state of con templating the situation with the necessary distinctness and practical knowledge. The importance of the situation and the difficulty of the moment impose upon us the duty of explaining the question once more and of enHghtening Your Highness, your honourable colleagues and, above all, His Majesty on every detail. To help you to deduce from your considerations and judgment some appropriate results with greater ease, I will point out to you verbatim the fundamental provisions of the Constitution Act.